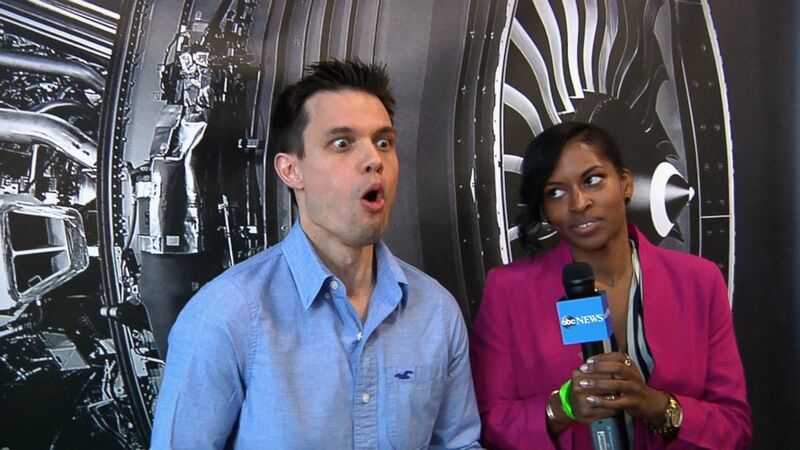 ABC News' Dan Childs eats the worlds hottest pepper at the NYC Hot Sauce Expo. camera (Michael Nedelman/ABC News) The Carolina Reaper holds the title for the world's hottest pepper in the Guinness Book of World Records. If you’re going to eat the world’s hottest pepper, take my advice: Don’t think about what happens next. “It is nothing but pain,” said Ed Currie (his real name), president of the Puckerbutt Pepper Company (his company’s real name) and creator of the record-setting Carolina Reaper pepper. “I gave it to my friends, and they all started regurgitating, so I knew I had something really good,” he told me at the NYC Hot Sauce Expo, where his pepper was the star of the show. To the uninitiated, a Carolina Reaper looks a bit like a habanero pepper with raisin-like wrinkles. It’s as bright red as a warning flag. For the viewers of ABC News HealthLab's new interactive video, I decided I would eat the pepper while a thermographic camera recorded the temperature changes in my face. I wanted to narrate the experience as it happened, describing what it was like to sample this notorious beast. The first three seconds after eating the pepper were sweet oblivion. It wasn't bad. You chew, it crunches like a bell pepper. And then the pain. And the heat. Blinding. Searing. These were the words I attempted to conjure for the camera, but when I opened my mouth all that would emerge was a hiccup -- my stomach rejecting the Reaper. I had made a horrible, horrible mistake. (Michael Nedelman/ABC News) ABC News' Dan Childs eats the worlds hottest pepper at the NYC Hot Sauce Expo. I had a front-row seat to the powers of capsaicin -- the chemical in hot peppers that gives them their characteristic burn. To learn more, I reached out to Dr. Paul Wise of the Monell Chemical Senses Center in Philadelphia. “Much like bitter taste, plants have developed these chemicals as a defensive mechanism against predators,” Wise said. Eating even the hottest of peppers shouldn’t cause any kind of harm, he said. Instead, the capsaicin triggers the same nerve endings that respond to pain and high temperatures, fooling the brain into thinking that there is a fire in your mouth. “At sufficient concentrations, these chemicals will trigger reflexes -- like tearing, a runny nose, coughing, sneezing -- all of these mechanisms intended to clear the chemical from the system,” Wise said. 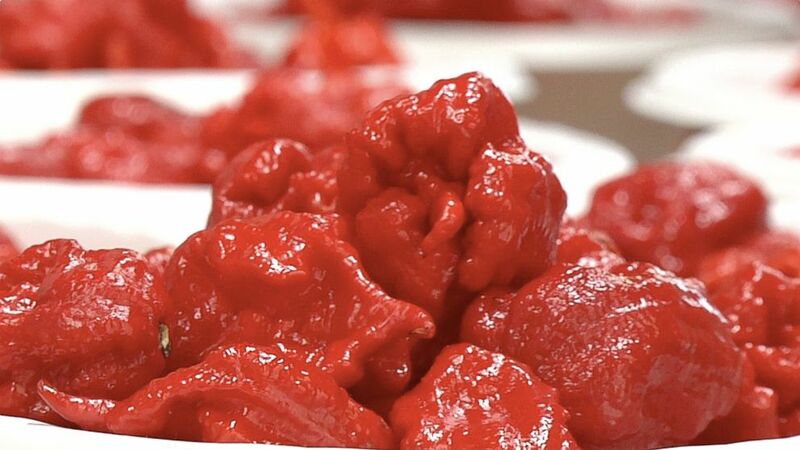 What makes the Carolina Reaper particularly special is exactly how much capsaicin each tiny fruit harbors. To explain this, scientists look to a measure known as Scoville units. The higher the number, the hotter the pepper. Jalapenos register at a few thousand Scoville units. Habaneros, about a quarter of a million, on average. The Carolina Reaper, however, weighs in at a blistering 1.6 million Scoville units on average, according to the Guinness Book of World Records -- and individual peppers have rated even hotter than this. But what does 1.6 million Scoville units feel like? (Michael Nedelman/ABC News) Wayne Algenio washes down nearly 22 Carolina Reaper peppers after winning the Guinness record for the most peppers eaten in 60 seconds. Minutes before trying the pepper, I had witnessed a steady stream of brave souls who, one by one, tried to break the Guinness world record for consuming the most of these peppers in a minute. The victor and new record-holder, Wayne Algenio, ate roughly 22 Carolina Reapers in 60 seconds that day. He lived to tell the tale. Algenio is a competitive eater -- a Filipino-American who also happens to be the world record holder for most balut eaten in five minutes. However, his attempt to garner the Guinness title last year landed him in second place. This year, he came ready to win -- and to suffer. In order to clinch the title, competitors must wait an additional full minute before sipping any liquid. That, Algenio said, is when the true effects of the pepper kick in. There he was, curled up in a fetal position on the floor of the bathroom at the Brooklyn Expo Center. At times, he pressed his face against the cool walls of the bathroom stall for relief. Asked if he would ever put himself through the ordeal of eating a Carolina Reaper again, he said only if someone broke his record of 119 grams of the pepper in a minute. I do not relish the prospect of trying the Reaper again myself. But the experience was a memorable one, to say the least, and it left me with more than just a warm feeling deep inside.